Last week, I had the pleasure of visiting with my good friend Aggie, as well as an opportunity to meet The Queen. Thank you, rain! This week, it’s back to work. Sadly, not much in the kitchen, but instead a resumption of the tree battle. Looks like we’re winning, it’s just one of those long, drawn-out affairs! Yesterday, we actually bought a trailer to haul brush. I feel like an honest to goodness Texan now. I own a trailer. We had borrowed one from Hubby’s friend. Twice. But the brush just keeps coming! And though it was awfully nice and thoughtful of said friend to let us borrow his trailer, he’d like to use it also! Go figure. Plus, I was starting to get pretty tired of piling up the brush and small trees, then days later, moving them onto the trailer for disposal. Seems like picking up a stick ONE time would be sufficient. Especially when there are a LOT of sticks! And trees. Anyhow, I realize in my zeal to get the trailer, requiring a drive out to New Caney ( small town on the NE side of Houston ), I failed to post anything for Caturday, my favorite day of the week. Instead, here is a late Caturday posting, with exciting pics of big pine trees being chain sawed to follow tomorrow! 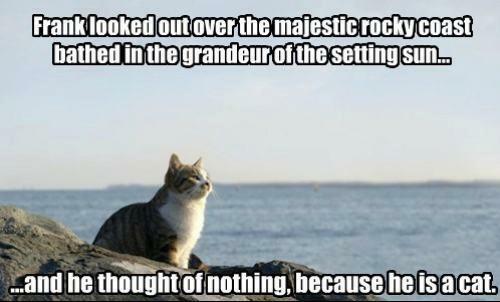 Hope your Sunday is majestic! Previous Stress… Next Is it Caturday yet? I had a great time visiting! Hope to see all of you next time!